I remember the first time I saw a John Hughes film. Being from Chicago myself, I was relating to so many moments, memories and ideas that went into making some of his iconic films such as Sixteen Candles, National Lampoon's Vacation and of course the classic Home Alone. When I came across this book, "Searching For John Hughes" I was really intrigued by Jason Diamond and his own impact that those movies played on his life as well. Jason grew up in the Chicago suburbs like myself and Hughes immortalized in his own movies. Going through a rough and unhappy childhood and adolescence, he felt connected to these stories and a sense of hope while struggling to define himself outside of his parent's negative and neglectfulness. Diamond ends up moving to New York after high school where he finds low paying jobs to make ends meet. 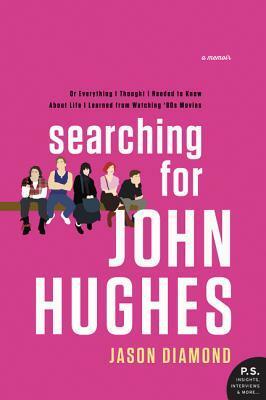 With a dream of writing his own book, be began to research his pop icon, attempting to gain interviews with those who have worked with Hughes all while allowing him to accept his past and bring him to a happier future. What I really appreciated about this memoir was the story that Jason shares of his personal dark and depressing days, becoming homeless and thinking everything was lost at such a young age. The small glimmer of hope that Hughe's movie endings seem to share with Diamond that helps him keep going through it all is inspiring. While some may not relate to this book if they didn't grow up in the John Hughes era, it will strike with those who are looking for inspiration and finding it in the most unlikely of places. If you would like more information about Jason Diamond and his book, check out his website or follow him on Twitter or Instagram. Be sure to check out the book on Good Reads or feel free to see what other's have written about the novel on the rest of the blog tour! This books sounds so good, I have a love affair of John Hughes movies so I'll definitely be checking this out!